Let’s be honest: there are a half-dozen or more fights that would have made this column in any other month, but failed to make the cut because July traditionally features an insane number of events and outstanding matchups, and this year is no different. Had it taken place in June or landed in August, the lightweight scrap between MMA Lab prospect Drakkar Klose and Marc Diakiese and his Tekken technique earns a spot as the sneaky good battle of upstarts you need to watch. Lack of space means I have to leave the heavyweight clash between Fabricio Werdum and Alistair Overeem off the list; same with Anthony Pettis’ return to lightweight against perennial tough out Jim Miller. After his thrilling comeback win over Mirsad Bektic earlier this year, Darren Elkins deserves mention as he readies to face Dennis Bermudez, but there simply isn’t room. And featherweights Ricardo Lamas and Jason Knight would normally merit a place in this collection of the best fights to hit the cage in the month ahead, but their UFC 214 battle had to get bumped as well. I wish there was a way for me to work them into this list, but July is just too jammed with outstanding action that those six fights and several others didn’t make the cut. Here’s a look at the most exciting, intriguing and important fights on tap for the month ahead. This is The 10 for July 2017. The latest former World Series of Fighting champion to migrate to the Octagon, Gaethje is taking a similar approach to his UFC debut as bantamweight standout Marlon Moraes, jumping into the deep end of the lightweight division with a dangerous headlining assignment against a permanent resident of the Top 10 in Johnson. Unbeaten in 17 career fights, the 28-year-old newcomer is all offense, all the time, coming forward without hesitation, slinging hands and smashing home heavy kicks without much concern for covering up. Gaethje believes he’ll either beat you to the punch or land the bigger shot and thus far, he’s been right. Johnson has spent the last couple years facing the best the lightweight division has to offer, earning victories over Edson Barboza and Dustin Poirier along the way. “The Menace” is game for going toe-to-toe with anyone and you best believe he would love to be the first to hand Gaethje a defeat. This should be fire from the get-go and whoever emerges from the ashes with their hand raised in victory will be in a position to mix it up with another lightweight standout in the second half of the year. The top two contenders in the 185-pound ranks clash in this contest to crown an interim champion at a point when both are at their absolute apex in terms of performance. Last time out, Romero laid out Chris Weidman in NYC, connecting with a perfectly timed flying knee that felled the former champion and pushed his winning streak to eight. The 40-year-old former Cuban Olympian might be the best athlete in the UFC, and his explosive power and tremendous speed make him a threat to end a fight at any time. Whittaker had been operating in the shadows of the middleweight division through his first four bouts in the division, but a first-round knockout win over Derek Brunson last November elevated him into the spotlight and his second-round stoppage victory over Jacare Souza in April established him as a legitimate championship threat. Now the surging 26-year-old puts his own lengthy winning streak on the line as he continues his quest to claim UFC gold. This is a bout that has been a tantalizing possibility since Nunes ascended to the throne, and now it is almost here. Their first meeting at UFC 196 was a tale of two fights – the first two rounds that were controlled by Nunes and the final frame that saw Shevchenko shift momentum in her favor. Had it been a five-round fight, it seemed like the talented kickboxer from Kyrgyzstan would claim the victory, but alas it was only a 15-minute affair and Nunes rightfully had her hand raised in victory. They’ve each fought and won twice since – Nunes blistering Miesha Tate to claim the women’s bantamweight title at UFC 200 and doing the same to Ronda Rousey to successfully defend her title to close out the year at UFC 207, while Shevchenko picked up a decision win over Holly Holm before submitting Julianna Pena in January to set the stage for this clash. Will the champion continue to reign by wielding her iron fists or will the challenger build on the success she had in the final stages of their first fight and usurp the throne? Some might want to question the inclusion of this fight in this collection, but I don’t want to hear it and not just because it’s my list. Calvillo has wasted little time in establishing herself as someone to watch in the strawweight division, picking up a pair of victories in the span of four weeks to push her record to 5-0. When you show up acting like being on the big stage is no big deal and back it up with back-to-back submission wins, I’m giving you some love heading into your next fight. After tapping Amanda Cooper and Pearl Gonzalez, Calvillo gets a considerable step up in competition for her third foray into the Octagon in the form of Calderwood. The hometown favorite came out on the wrong side of things in her last outing, but remains one of the more experienced fighters in the strawweight ranks. Though she’s struggled to find consistency inside the UFC cage thus far, when Calderwood is locked in and firing on all cylinders, she pushes a suffocating pace and delivers heaps of punishment. It’s time to find out if Calvillo is a legitimate contender or not, and this fight with Calderwood should provide the answer. Ponzinibbio has quietly put together a four-fight winning streak that has carried him into both the welterweight rankings and the first main event of his UFC career. What is his reward for such strong results? 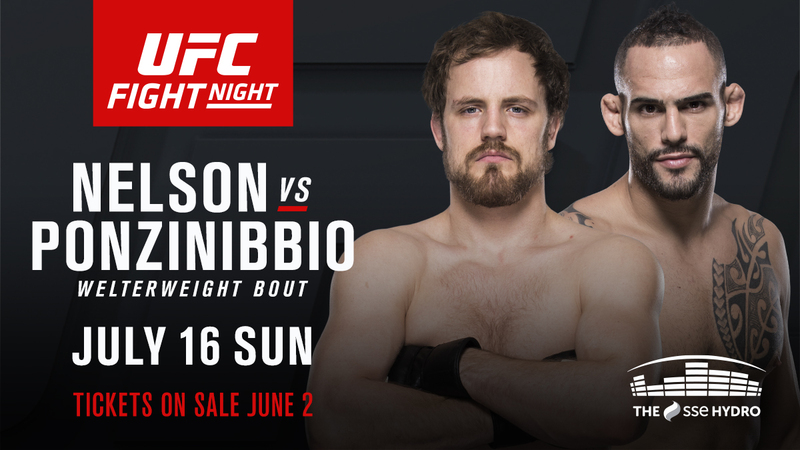 A trip across the Atlantic to face Nelson in the toughest fight of his career, that’s all. The standout from Iceland is one of those guys you tend to forget about until you see his name on the marquee or fight card, and then you remember that he’s a technically sound, clinically efficient, legitimate Top 10 welterweight. This has the potential to be a really interesting stylistic battle because despite perceptions that they’re each primarily focused on one area – Ponzinibbio boasting powerful striking, Nelson a virtuoso on the ground – they’re actually both quite skilled in the other’s strong suit, which could create present some fun strategic puzzles to solve and deliver a slew of explosive exchanges as well. If you’re looking for the best matchup of the month that very few people are talking about right now, look no further than this bantamweight clash. Rivera might be the most slept on fighter on the UFC roster. The Team Tiger Schulmann representative just turned 27 and has rattled off 19 consecutive victories – 19 – including wins over Pedro Munhoz, Iuri Alcantara and Urijah Faber since arriving in the UFC. Meanwhile, all Almeida has done is win 22 of his first 23 pro bouts, 21 of them by way of stoppage, with his only setback coming against current bantamweight champion Cody Garbrandt. This is a matchup between the No. 5 and No. 9 fighters in the division and it’s flying under the radar – that’s how stacked this month’s slate of action is. What an intriguing crossroads fight we’ve got here. On one side, you’ve got Weidman, the former middleweight champion, fighting at home on Long Island, entering on a three-fight losing streak. On the other side stands Gastelum, the former TUF winner who still eyes a future at welterweight despite knocking on the door of contention in the 185-pound ranks. Can the struggling former titleholder get things turned around or will the surging upstart keep rolling and build a further case for title contention? Originally scheduled to be a bout between Cyborg and fellow former Invicta FC featherweight champ Megan Anderson, personal issues prompted the Aussie’s withdrawal and paved the way for Evinger to step in and turn up the intrigue on this already anticipated championship clash. A true pioneer, Evinger has been on an absolute tear over the last several years competing under the Invicta FC banner. The Houston-based veteran has gone 7-0 with one no contest while establishing herself as one of the top talents competing outside the UFC, running her overall unbeaten streak to 11. Now “Triple Threat” takes a step up in weight to square off with Cyborg, who earned stoppage victories in each of her first two Octagon appearances to push her own undefeated streak to 18 and counting. Anderson has been on a roll and deserves props for chasing down a fight with Cyborg, but there is something compelling about switching her out with the more seasoned, more savvy, more gritty Evinger that ups the intrigue heading into this one. She is the most experienced and skilled opponent Cyborg has faced in years and the two should combine for a crackerjack of a championship fight at the end of July. After battling Stephen Thompson to a draw at UFC 205 last November, Woodley and “Wonderboy” ran it back in March with the champion retaining his title with a majority decision victory. The need for a rematch also prompted Maia to stay active and the Brazilian maintained his place at the top of the list of contenders with a hard-fought win over Jorge Masvidal at UFC 211. Now these foes that have been circling each other since Woodley won the belt last summer and Maia made quick work of Carlos Condit four weeks later are locked in and set to collide in a battle for welterweight supremacy. Will the champion shut down the submission specialist’s suffocating grappling game and continue to rule the division or will the challenger extend his winning streak to eight and rise to the top of the 170-pound ranks? This one has been such a long time coming that I know that you know all the particulars about this pairing between bitter rivals, so let’s just hit some of the questions hovering around this fight before we get out of here for this month. How much did Cormier learn from their first clash and what adjustments will he be able to make after having spent 25 minutes in the cage with Jones once before? What impact – if any – will Jones’ time off have on his performance? He didn’t look overly sharp against Ovince Saint Preux back at UFC 197, but how much of that was due to the short notice nature of the bout or gamesmanship on the part of the former champion? Is either one going to be slowed by their emotions, given that this isn’t “just another fight,” but rather a long-awaited, highly contentious clash of fierce rivals with a legitimate dislike for one another?